- Fry the giant ice cube in front of you. Walk forward and tug on the tongue of the statue in the north. This will activate moving platforms back south. Hop on! - Before going anywhere, run south as the elevator is descending. You'll get beneath the entrance platform and find a chest containing 300 rupees. - Ride the lift down to B3. There are two chests here: one contains a single rupee, the other a Monster Horn. Opening the rupee chest (left) summons five wizards. Take 'em out and get back on the elevator. Ride it to the bottom. - At the very bottom is a big chest containing the Big Key. Wooooo! Easy! - Ride the elevator back up, until you see a room with a patrolling, icy skull-thing and many icicles formed on the ground. Use the Fire Rod to kill the circling enemy as well as melt the icicle beneath the Small Key on the left side of the room. - Use the Key on the door to the north. Don't worry about the wizards in the room. - Pullon the tongue of the left goblin statue in the adjacent room. (The right goblin's tongue only summons enemies.) Be wary, as the right ice statue here will come to life and charge at you. Use the Fire Rod to melt it down. - Go east. Kill the sliding penguin things in this room, then light the four braziers in the middle of the floor. This will a Small Key. Walk south one room, grab the Compass from the nearby chest, then head onto the thin, blue walkway that leads east and north. Follow it to the Key on the previous screen. - Go back south. Take the southern route along the walkway to wind up at a locked door where you can use the Key you just found. - You're on the upper floor of the first room on B1. Merge with the wall and travel north to find five rupees in a chest. Merge again and travel to the left side to find a statue; yanking on its tongue causes the floor below to descend one level. Drop down. - To the south of where you come out is a button beneath an icicle. burn it down with the Fire Rod and step on the button to open a door to the north. Go through and drop through the hole in the floor. - Use the Tornado Rod to wipe out the Bomb-spewing fliers here, then step on the rotating platform to your left. 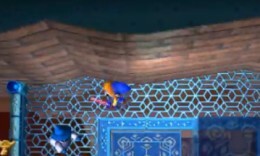 Huck a Bomb onto the platform with the orb switches to the north to activate them. This will make a chest containing 100 rupees appear. - Hop on the rotating platform and head west, then south. - On the next screen you'll find two rotating ice platforms, surrounded by a plentitude of annoying bats. Stand in the middle of one of the platforms as it makes it srounds and kill the bats, one by one. Once that's done, use the Fire Rod to hit the brazier. This will activate a platform in the north. Take the southeast path out of here to find Monster Guts in a chest, the backtrack. Ride back to the northern platform and get on. - Ride platforms south until you're over the treasure chest on B4, one you couldn't reach earlier. Drop down to receive 50 rupees. - Go back upstairs. Ride the platforms south, east, up and north until you're on a contained balcony in a large room, to the right of several large ice blocks. Melt through them with the Fire Rod until you reveal an orb switch. Lob a Bomb to activate it. - Leave the room and go back north. Enter this room from the right entrance and merge with the wall to wind up on the platform where you'd just melted a bunch of ice. Step on the platform you activated and it'll lift you up a level. - There are two stone cyclopses to kill up here. Try to knock them off the sides rather than confronting them directly. Hit the button beneath the skulls to your left to open up a nearby room. - Yank on the goblin's tongue here to reveal a big chest below. This contains the Stamina Scroll, which increases your energe gauge. More magic for you. - Return to B2 and merge with the wall to get back to the main hallway where you started. Go to the northern room, drop down into the hole, and yank on the tongue of the goblin statue to reveal another pit below. - Kill the rotating skull, then try to go through one of the doors. This will reveal a battle with more sliding lizards, including one huge one. The best way to deal with this battle is to simply back yourself into a corner and swipe as they rush in. Beating them will open the doors and trigger a teleporter which will return you to the entrance of the dungeon, if you so wish. - Go out the western door. Use a Bomb on the ice path ahead to kill the enemies on it, then move across it yourself, slowly on the first run and quickly on the second. Yank on the statue's tongue to move a platform elsewhere. Return to the room you were in before and go east instead. - In the next room are more statue creatures; the second and fourth you come across come to life. Use the Fire Rod beneath the brazier in the center of the room to open the southern door. - There are wizards out here. Kill the two on either side of you, then hit the button to the left. Merge with the wall to the south and wander along it to the southern walkways. Drop through the hole above the treasure chest here; inside is a Small Key. - Walk west along the narrow pathway. Hit the button at the end to return to the elevator. - Use the Key on the locked door in the north. Drop down through the hole here beside the giant ice cube on the next level down. - Fry the ice cube. This creates a torrent of wind. Hop in and it'll usher you to a goblin statue. Yank dat tongue. - Hop off to the north and drop through the hole in the floor you just made in the previous room. - Follow the northern path. Kill the enemies when you reach the next fragile ice walkway, then make your way along it to the south. Once in the far south, kill yet more enemies, step onto the last fragile ice pad, and light the brazier to the north with your Fire Rod. This opens a path to the east. - Go north when the path splits and yank on yet another tongue. This brings up a large platform to the north. Go west along it (and hit the button to the north for more ease of passage later). - Big door. Big Key. You know what to do. 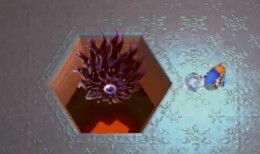 Nintendo really likes its eyeball creatures. Kholdstare is a nervous creature. It starts off by enveloping itself in an icy shield, and will thereafter move around the room, trying to evade you. When Kholdstare stops it will project three balls of energy to create a triangle; if you're caught in the triangle at the wrong time, you'll be frozen and take damage. Use the Fire Rod from a distance to thaw Kholdstare's ice shield, then run in and smack it as much as you can. I recommend using the sword rather than the Fire Rod, as you'll want to preserve your energy gauge. Do enough damage and Kholdstare will adopt a new tactic: occasionally, when stopped, it will fire the orbs at you in a medium-range attack. Otherwise, business as usual. Continue doing damage and, once Kholdstare turns red, it will gain three more orbs, amounting to two triangles to dodge, and move more quickly. Still, your tactics are largely the same. Keep whacking away until Kholdstare is no more. Beating Kholdstare will earn you a Heart Container. You'll also free Sage Rosso, the last of the Sages in Lorule. Woooooooot! Assuming this is your last dungeon (and given the difficulty it probably should be) you'll gain the Triforce of Courage. Now that's just sweet.